The last time I was in Baden for our Chapter meetings, I was talking with some of our sisters, including Sr. Mildred, who celebrated her birthday this summer – I may not have this exactly right, but if she’s not the most senior sister in our community, she’s pretty close, having just turned 96. 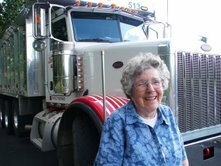 When asked what she wanted for her birthday, she said she wanted to go for a ride in an 18-wheeler – yup, now there’s another nun I want to be like when I grow up! So Sr. Lyn made some arrangements, and on a nice day in August, a shiny, big tri-axle dump truck showed up, and Mildred had her ride. Not an 18-wheeler, but I guess this truck was so big, it needed special permits from the municipality to be driven onto the campus. On my congregation’s web site, there is a section called “Sharing Our Mission” that lists some ways that you might want to consider joining us in our mission of promoting love of God and love of neighbor without distinction. On that page is a prayer request form, and if you have some intention for which you would like to request prayers, just fill out that form to have our sisters pray for your intention. This is not to say that you cannot ask me and the rest of this little blog community for prayers. It’s just that we have a number of senior sisters who consider such prayer to be their full-time ministry, and let me tell you – they are on it big time! I count on their prayers all the time, and I know there’s plenty to go around, so feel free to ask…below your prayer request, you might mention that you heard about this ministry from my blog. Well, I am headed to the mothership today for an afternoon meeting, and then we celebrate Golden Jubilee on Saturday. I’m not where I want to be on my work at the moment, but I am confident things will come together by the time the students show up on Tuesday – I will once again need to avail myself of my sisters’ prayer ministry, and yours too, if you feel so inclined! While surfing the web yesterday, I came upon the website of the Sisters of St. Joseph of St. Augustine, Florida, who provide a great resource for prayer, using a form of the “Maxims of Perfection”, a core document pertaining to the spirituality of the Sisters of St. Joseph. They were written in the 17th century, in a literary style that might seem a bit out of step with modern sensibilities. Still, they are a great resource for prayer and meditation, not only for my sisters and me, but for anyone seeking to deepen her/his relationship with God. This website provides with each maxim, a selection of related scripture passages as well as some reflection questions. Here’s an excerpt from their website, along with a link to the website. The Maxims that appear on our website are addressed to laypersons and religious who seek a life with God. They were first published in 1657. Father Jean-Pierre Medaille, SJ, who, with the six original Sisters, founded the Sisters of St. Joseph on October 15, 1650, selected one hundred of the maxims for the Sisters as a brief “resume” of the spirit of the Institute. I want to be like Sr. Catherine when I grow up. Catherine is long-time staff member of NETWORK, a national Catholic social justice lobby. Here’s a summary of a story about her in the Aug. 18 issue of the Cleveland Plain Dealer. An 86-year-old nun from Cleveland who works for a Catholic anti-poverty lobbying group has been selected to deliver the closing prayers one night during the Democratic National Convention. “I think you have a different perspective when you’ve lived some history,” says Catherine Pinkerton, a member of the Cleveland-based religious order Congregation of St. Joseph who once served as principal of the West Side secondary school it founded, St. Joseph Academy. Pinkerton says that she has never been an activist for either political party but that she admires Barack Obama’s “vision of where we stand as a nation and where we stand among nations” and agreed to deliver the benediction at the request of his campaign. I was thinking about this past Sunday’s gospel reading, and found this reflection on the Sojourner’s Magazine website. Would that we all would be willing to embrace truth, even if it means admitting we’ve been wrong. An Indigenous woman asks Jesus to help her child, and he calls the woman a dog (Matthew 15:21-28). Various scholars and homilists have attempted to make this story nice—for example, Jesus was testing the woman because he recognized her strength of character; the two engaged in a mutual exercise of role-playing to teach the disciples a lesson; the exchange was playful and the dogs in question were puppies and pets. To me, these are weak arguments. The story is powerful, but it is not nice—“dog” is an insult to a woman who is racialized and colonized, and it is Jesus, not the disciples, doing the insulting. Whether it is due to desperation, absolute focus on her child, or some deep integrity and wholeness, the woman is not shamed; indeed, she acts shamelessly by engaging Jesus in a public contest of wit. Unlike his many similar exchanges with scribes, Phari­sees, and leaders, Jesus is not the winner. The doubly marginalized Ca­naanite woman has the last, and best, word. This is a profound challenge to the gender-based honor/shame system—a shameless woman is honored and Jesus is apparently shamed. Rather than slinking offstage or mounting a counterattack, Jesus broadens his understanding of who the kingdom is for and honors his opponent: “Then Jesus answered her, ‘Woman, great is your faith! Let it be done for you as you wish.’ And her daughter was healed instantly” (Matthew 15:28). BTW, Jim Wallis will be coming to speak at UDM on Thursday, Sept. 18. It’s free and open to the public, so if you can make it to Detroit that day, you’ll be in for a real treat. So, I was playing around with this site called meez.com, that lets you create animated avatars. You’d think I would have better things to do with my time, and I do…but any way, I created two of them. First, we have the “Techie Nun,” as I refer to myself on this blog. Then we have the second one, called “Biking Nun.” They look a little weird, because it seems when I exported the files, it didn’t get all the frames of the animated GIFs, so you never see “meez” riding around on the bike or looking up from the computer. Oh well…they looked fine when I created them. Anyway, just some more techie stuff to play with. Any of you find any fun stuff out there you want to share with the rest of us? There is no doubt in my mind that at least we US citizens are immersed in a culture of fear. We who have so many advantages, and use so much of the world’s resources, are taught to fear “the other.” If we allow more immigrants, they will take our jobs. If we do not fight terrorism aggressively by employing a preemptive strike strategy, we will be victims of terrorism. If we do not execute the criminals, it will encourage others to commit crimes. If we support our LGBTQ brothers and sisters, it will threaten the institution of marriage. I’m sure you can think of other examples. Consider this excerpt from an article in the April 2008 issue of U.S. Catholic, which discusses how the “culture of fear” plays out in U.S. electoral politics. Jesus, who lived in a very dangerous time and place, told his disciples to “be not afraid.” American Christians need to take that direction to heart. We need to stop worshiping safety and security and face the fact that life is full of risks. We are all frail and mortal human beings, and no president with his finger on the world’s largest arsenal is going to protect us from those risks. No tough guy is going to ride into town and wipe out evil or destroy all our enemies. The simple truth is that we cannot conquer our fears by scaring everybody else. McCormick, Patrick. “Lions and tigers and bears, oh my! Though we Americans often vote our fears, we should ignore the Cowardly Lions within us and elect lawmakers who demonstrate more brains and heart. (culture in context).” U.S. Catholic 73.4 (April 1, 2008): 42(2). I believe that we in religious communities are not immune from this pressure to be self-protective. There is a legitimate need for us to tend to the health of the institution – we have frail elderly sisters who deserve our efforts to care for them. And we must weigh the risk of any action we take, both as a congregation, and as individuals connected to the congregation, against these legitimate needs. But risk we must – there is too much at stake to let our fears paralyze us. It is a delicate balancing act.